Automatic conversion to a string. This convert the FileStatus to a string without mapping id's to names. The complete description of a file's attributes. Definition at line 346 of file file.h. Definition at line 351 of file file.h. Definition at line 359 of file file.h. "rwxrwxrwx 12/28/57 01:02:03 owner_id group_id size name". 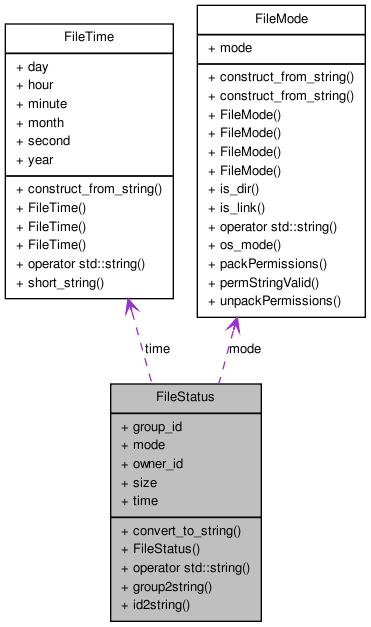 convert the file's status (ie attributes) into a string -- optionally resolving the user and group id numbers into string names. This can be time consuming, so it is optional. Definition at line 539 of file file.cxx. Definition at line 1057 of file file.cxx. id2string(int) is a static method that converts user id numbers to strings. Definition at line 1038 of file file.cxx. Definition at line 378 of file file.h. Output the FileStatus to a stream as a string. Definition at line 385 of file file.h. Definition at line 353 of file file.h. Definition at line 356 of file file.h. Definition at line 354 of file file.h. Definition at line 355 of file file.h.